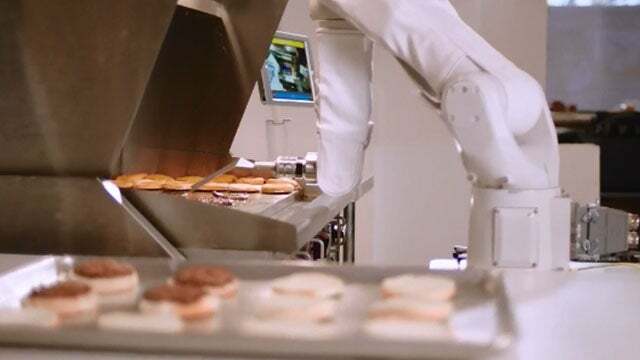 RUSH: Flippy, the burger flipping robot. This story is in Investor’s Business Daily, but it’s actually a story that takes place in Pasadena, California. There is a company out there, burger joint — well, it’s bigger than a joint. It’s called CaliBurger, and they have just installed Flippy the robot to cook hamburgers at some of their joints. Flippy — and there’s a picture of Flippy here. He’s a little white arm that can flip burger patties expertly. Flippy can do it at precisely the right time because Flippy has sensors that are able to determine the exact temperature of the hamburger patty, and when that temperature is reached, Flippy is programmed to flip it to the other side. And then, when the temperature is reached again, Flippy takes the burger off the grill and puts it on a bun. Flippy can do this 150 times an hour, and Flippy never complains about it. Flippy never asks for a health care plan. Flippy never asks for a raise. Flippy never refuses to stand during the national anthem when they open the store every day. Flippy never even says a word. Flippy doesn’t have a disciplinary problem. Flippy never calls in sick. Flippy never gets sick. Flippy either has or doesn’t have a green card, whatever is needed on that given day. Flippy will never walk out because Flippy can’t walk. Flippy will never steal from you because Flippy doesn’t consume whatever he’s flipping. Flippy cannot walk out of the store with any of the stuff that he’s cooking. Flippy is stationary and cannot cause any kind of human relations problem whatsoever. Flippy will never protest the store. Flippy will never give away product. Flippy costs $60,000. So CaliBurger determined that Flippy made much more long-term sense rather than hiring entry-level workers at minimum wage because in less than three months Pasadena’s minimum wage is going to rise to $12 an hour for those places with 25 or fewer employees and $13.25 an hour for those with 26 or more employees. The Pasadena minimum wage is higher even than California’s current minimum wage, which is climbing but will not hit $15 until 2022. So it’s four years away. So, I mean, look. It’s automation and there’s all kinds of Flippys already out there doing other things replacing entry-level workers. So you could say that Flippy is an inevitability. But raising the minimum wage, what have we always said? Those of us who have said an arbitrary minimum wage — which has no relationship to market forces or anything on the ground — does not make anybody wealthier, does not give anybody more money. What it results in is people losing their jobs. How many times have you heard me and others say, “You raise the minimum wage and you’re killing jobs”? It’s happened in the Seattle restaurant industry. You know how many restaurants have closed in Seattle with the minimum wage there rising to $15 an hour? They simply… They can’t afford it. So CaliBurger spends 60 grand for Flippy. There’s a 20% annual fee to maintain Flippy. But with the minimum wage set to skyrocket here by the middle of the year, three more months, they’ve run the numbers, and Flippy is gonna end up saving them so much money — and the related headaches they won’t have, the related theft they won’t have. If the minimum wage weren’t going up to $13.25, if the minimum wage were more in line with what the market would dictate, Flippy probably would not be employed for a couple or three years. So here you have cold, hard evidence that raising the minimum wage costs entry-level people their jobs. It does not give them more money. You know who knows this? The Democrat Party. They know this! Their advocacy of the minimum wage has nothing to do with helping people earn more money. This is the great myth. The Democrat Party knows full-well that raising the minimum wage is gonna cost jobs. But there are never any stories. Have you ever seen a story on a person who lost a job because the minimum wage went up? The media simply doesn’t do those stories. You never see them. That’s why the Flippy story is an opportunity. The value of raising the minimum wage, the value of advocating for raising the minimum wage for the Democrat Party is to create the illusion that they care about people. It’s to create the illusion that they have a heart whereas Big Business and small business do not have hearts. Raising the minimum wage is not about making people wealthier. Raising the minimum wage is not making people wealthy or getting people more money. It has nothing to do with that because it doesn’t do that. Raising the minimum wage costs jobs, but you never see… Well, you are starting to see that story in Seattle. But up ’til now, that story is never written. You never see the Drive-Bys go profile some schlub somewhere who didn’t get hired because the minimum wage is too high. You never see the story. So the Democrats are never hurt by it. They are aided, they are helped by the illusion and image they care about people. “The Democrats advocate for more money for people, and over here the Republicans and the businesses?” They say, “We’re not gonna do that. It’s gonna cost people their jobs.” Democrats and media say, “See? They don’t care! They don’t love people like we do. We are for the minimum wage being increased,” and that’s where it stops. It’s not about getting people more money. It’s about the illusion that had care more than other people. Once again, yet another exactly opposite crock of excrement.